The Conext SW pure sine-wave inverter / charger is for global off-grid solar and backup power applications. The Conext SW 2.5kW (24 VDC) is designed for remote, rural, and residential locations where solar energy is needed or where unreliable grid power is a concern. For higher load requirements, two Conext SW can be parallel stacked to provide 7.0kW of power. North American units feature split-phase input and output without the need for an external transformer. 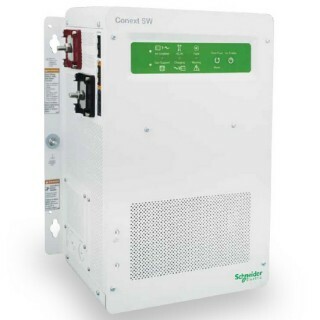 The Conext SW integrates additional value with available DC switchgear, AC switchgear, generator control module, intelligent load management module, network gateway, and solar charge controller devices. For unique global market power requirements installers will like the fact that 120 / 240VAC and 230 VAC Conext SW support both 50HZ and 60HZ operation.